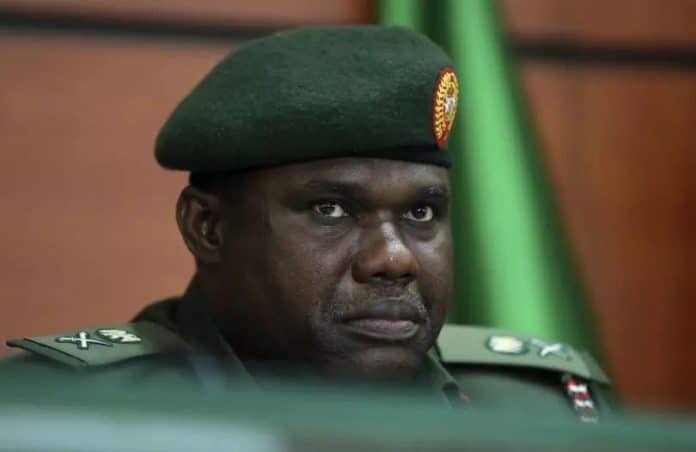 $2.1b deals: Ex-Army chief Minimah refunds N1.7b – Royal Times of Nigeria. Former Chief of Army Staff Gen. Kenneth Minimah (retd) has refunded about N1.7billion to EFCC, TheNation reports. According to the report, the refund followed extensive investigation by the anti-graft agency on the report and recommendations of the Presidential Committee on Audit of Defence Equipment Procurement (CADEP). CADEP had uncovered irregularities in the procurement and award of contracts in the Army and suspicious transactions in the accounts of the Defence Industry Corporation of Nigeria (DICON) during Gen. Minimah’s tenure. A top EFCC source, was quoted as saying: “We have interrogated Gen. Minimah and he has started refunding some funds. So far, he has refunded about N1.7billion in two tranches to the EFCC. So far, he has cooperated with us and we are hopeful that he will still make more refunds, in line with some contracts awarded by the Army.” . The CADEP panel had also observed that a company was registered on November 17, 2014 and awarded $125,179,299.10 on the same day.